Cakes & More: Roasted Plum And Almond Mousse With Vanilla Bean Tuiles - For The KitchenAid Contest! Roasted Plum And Almond Mousse With Vanilla Bean Tuiles - For The KitchenAid Contest! 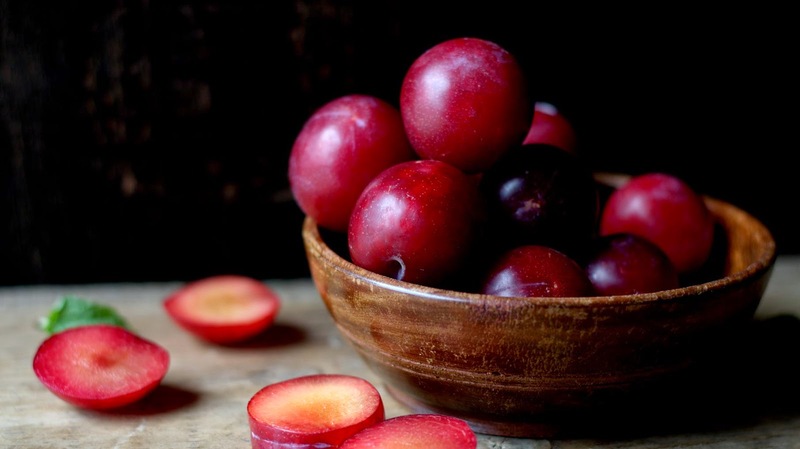 Glistening, deep hued plums on a plate and the little boy longing to taste them. As a kid, this image in Tolstoy's The Plum Stone made me wish I could eat them too. A taste of the local plums here much later taught me, some things look better than they taste. Every season, stone fruit evokes envy in the blogger in me. Such gorgeous looking fruit, but am strangely not a raving fan of their taste, especially when cooked. So when the organizers of IFBM announced the KitchenAid Contest, I was a tad disappointed that the ingredient to be used was fresh plums. And the prize to be won a Kitchen Aid Chopper, an appliance I would love to own (among others). This, without an iota of doubt, is scorned plums taking their sweet -tangy revenge on me! I normally do not make an effort to participate in competitions, but this would be fun! I just had to figure out how to make plums taste good. Very ambitious of me indeed! Cobblers, crisps, crumbles, galettes, cakes, (pretty much everything baked!) ruled out as in my opinion, baking fruit normally makes them taste even more tart. That left only one option - using pureed plums. Hope! Finding myself in uncharted waters, in my most polite tone, I asked the lady at the cart for some sweet, ripe plums. Am wary as I have been told off more than once when I have tried to select fruit. Has this happened to you? Her mentioning that these may the last lot of the season made me half-heartedly but hastily buy some fruit. These would be good for some much needed photography practice if nothing else! That done, roasted them in the oven with some sugar and vanilla. Tangy-sweet, like jam with a gorgeous hue! And then tried something I thought should taste good .Crème Patissière. This time around with roasted ground almonds. Mixed in some plum puree. Easy here, want the flavor, but not much tang. Then some airy whipped cream. A tentative lick and surprise, this actually tastes good, vaguely reminding me of mulberry ice cream! Phew! Since I love them with creamy desserts, some dainty vanilla bean tuiles must be served alongside. Creamy, nutty with a nice, subtle but surely there berry flavor. 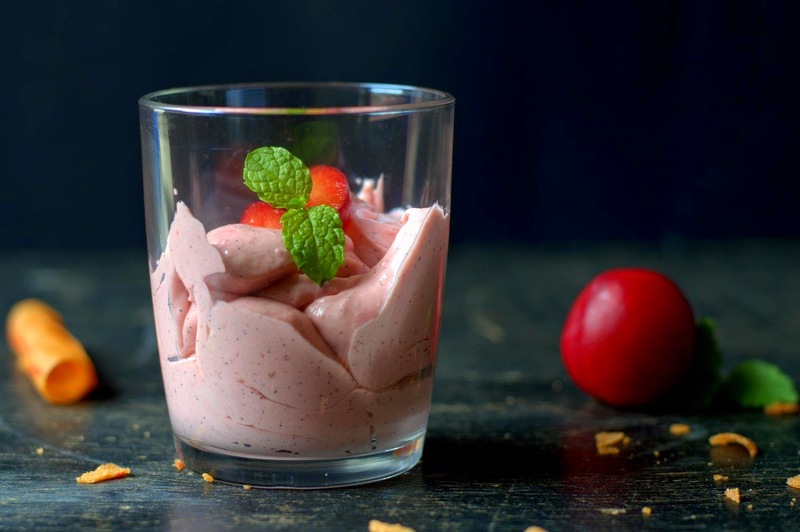 It is quite a mouthful, but shall we call this dessert Roasted Plum And Almond Mousse With Vanilla Bean Tuiles? Plum And Almond Crème Patissière : Basic recipe from Baking With Julia. Method : Suspend a fine meshed heat proof strainer over another heat-proof bowl. Take all ingredients except the almond meal in a medium sized heavy saucepan. On medium heat, whisking constantly, cook till it comes to a gentle boil .Boil for 30-60 seconds till the whisk leaves trail marks. This will be fairly thick. Immediately push through the strainer. Cover surface with cling film, allow to come to room temperature. Mix in the almond meal and the plum puree. If not using immediately, refrigerate. The cream thickens further on refrigeration. Pre-heat oven to 200 C / 400 F. Combine the ingredients and spread them in a single layer on a baking sheet. Bake for about 15 minutes till the fruit is soft and pulpy. Reserving the juices for another use, puree the pulpy portion. Refrigerate. You could make this ahead and use it the next day. This made about 1/2 a cup of thick, intense tasting puree. Gently fold in the whipped cream into the plum and almond pastry cream. Check and add more puree or cream to taste. But remember, too much of mixing too many times may cause the cream to be less airy (but still tasty). Spoon into dessert glasses, cover with cling wrap and chill for at least 3-4 hours. Garnish with vanilla poached plums if you like. Serve with Vanilla bean tuiles. You could also make dainty tuile cups or cigars and spoon in the mousse just before serving. 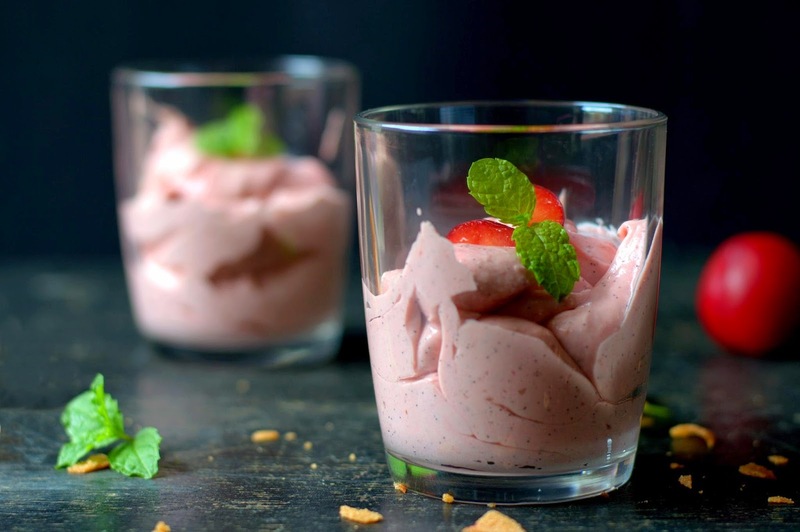 We liked the subtle berry flavor in the mousse after overnight refrigeration. The flavor seemed to mature and intensify after another day. I would recommend serving it after chilling for 3-4 hours or at the most after overnight refrigeration. 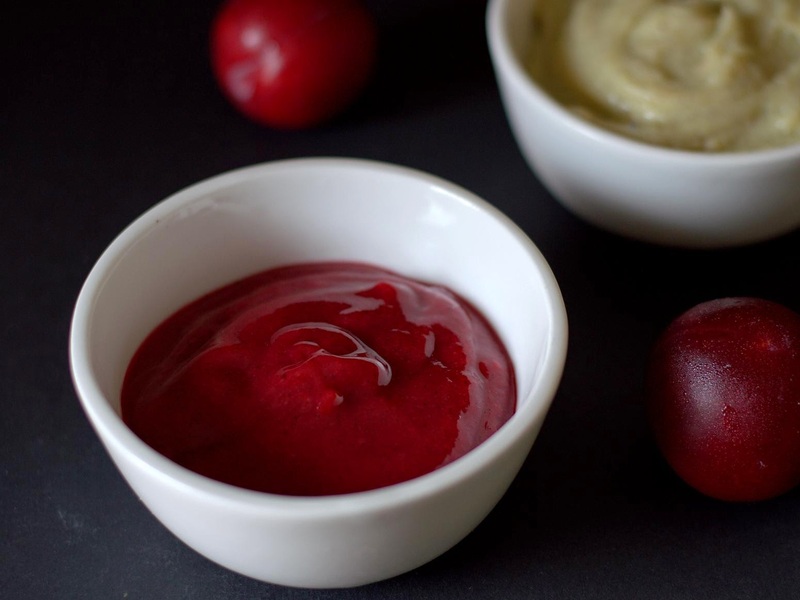 Note to self : The plum puree is of course one of the flavors you can use. I think any intense fruit puree should work great here. I found this recipe for pastry cream using cornstarch stabilized the mousse. But my preferred pastry cream taste-wise would be this recipe. Next time may be I will use it with agar stabilized whipped cream. Try with your favorite pastry cream recipe. This is just an idea, so feel free to play around!